You can NOW go on-line to: www.socalgrad.com and order your 2019 Cap/Gown/Tassel Unit. You can also call the company at: (714) 970-5025. A rep. will be available to assist you over the phone. The DEADLINE to order your cap/Gown/Tassel Unit for the Class of 2019 graduation is April 2019. 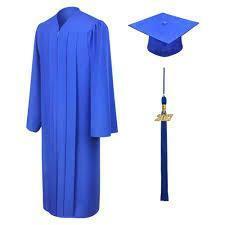 Even if you think, you might graduate, you need to order a Cap/Gown Unit. You can always get a refund from the company.